What are the advantages of using EDI2XML? 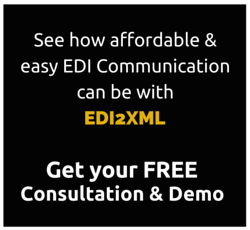 EDI2XML as a Service is the perfect option for businesses looking to simplify their entire EDI communication process with their Trading Partners. Our team of experts handle the entire new partner and new document setups and conversions, leaving you with a quick and painless setup phase. Then, our monthly EDI2XML service takes over from there to automatically process all incoming and outgoing documents for a smooth, continuous EDI flow between all partners. We work hard to ensure that your EDI project is setup quickly, on-time and within budget. We work in close collaboration with your own internal team as well as your Trading Partner’s team during this phase. Our full service offering handles all of your EDI requirements, leaving your team with no installation of hardware or software, no in-house EDI expertise required as well as no training needed for your employees. Essentially, EDI2XML leaves your team with more time to focus on other business priorities. Our full service offering also includes the seamless integration of EDI transactions within your business management system. We have already completed integration projects within Salesforce, SAP, Oracle’s JD Edwards, Shopify and the ErpWizard Suite. We’ve eliminated the need to manually enter data for every EDI transaction! EDI2XML is the result of several years of EDI experience. Due to our level of expertise, we are flexible enough to handle all sorts of EDI scenarios. It is proven to work the exact way you need it to! Our EDI2XML tool was designed to capture more than 90% of the EDI information in any given EDI document. However, we can customize the converters to function according to your specific requirements. System integrators don’t have to worry about upgradability of their converters. All converters are upgraded continuously as part of the ongoing service fees. We offer the very best support when it comes to your sensitive EDI communication process. We ensure our support team is always accessible to our customers for any type of request.